GreenBuilding.com - Provides green building information for homeowners and contractors. Covers sustainable construction methods and technology. Offers green building certification training. BuildingGreen.com - Provides accurate, unbiased, and timely green building information designed to help building-industry professionals. Provides a comprehensive report of the product features needed in order for a product to be considered green. BuildItGreen.org - Offers Certified Green Building Professional (CGBP) training program for CA home Builders and promotes green building practices in state California. Also, Contains Ask an Expert Section where you can get answers to your Green Building Questions. GreenHomeGuide.org - Green Home Building and Energy Efficient Home Improvement Community for homeowners in the US. ZeroEnergyProject.org - A marketplace connecting homebuyers, builders, designers and real estate professionals with resources for advancing the net zero energy home building adoption and growth. DesignandBuildwithMetal.com - Offers educational articles on advantages of metal construction, providing real life examples of numerous construction projects involving the use of metal. Contains directory of metal supply and manufacturers. Contractors working with metal can submit their projects to be published on www.designandbuildwithmetal.com. MetalConstruction.org - Metal Construction Association promotes the use of metal and sustainable design through marketing and education programs. Provides metal construction industry news and publications. Lists companies specializing in metal wall and roof construction and includes list of premium metal fabricators. New England Metal Roofing Calculator - Provides a specialty calculator for estimating metal roofing in comparison to conventional roofing systems. MBMA.com - Metal Building Manufacturers Association promotes the use of steel commercial and industrial construction, and low slope roofing applications. The significance of using steel is commercial and industrial building is that steel is a fully recyclable metal material; it qualifies for sustainable building material, it can be reused, and it can offer energy savings by keeping metal buildings and industrial roofs cooler thereby resulting in significant energy savings. CoolRoofs.org - Cool Roof Rating Council assigns ratings of solar reflectivity to roofing products such as metal roofing and solar reflective membranes. It provides accurate and credible methods for evaluating and labeling the solar reflectance and thermal emittance of roofing products. Thus, it promotes awareness of energy efficiency concept for metal roofing and rolled membrane products. It recognizes manufacturers as Cool Roof Certified, which in turn helps them gain competitive edge in energy efficient and sustainable roofing products market. MetalRoofs.org - A consumer education resource dedicated to residential metal roofing and metal wall panels for homes and living structures. Contains overview of materials, systems, and pricing information. MetalConstructionNews.com - Metal construction industry's original and most widely read news magazine. It helps educate contractors, fabricators, installers, suppliers and distributors about the use of metal in building systems, new and retrofit roofs, wall panels, interiors and decorative applications. 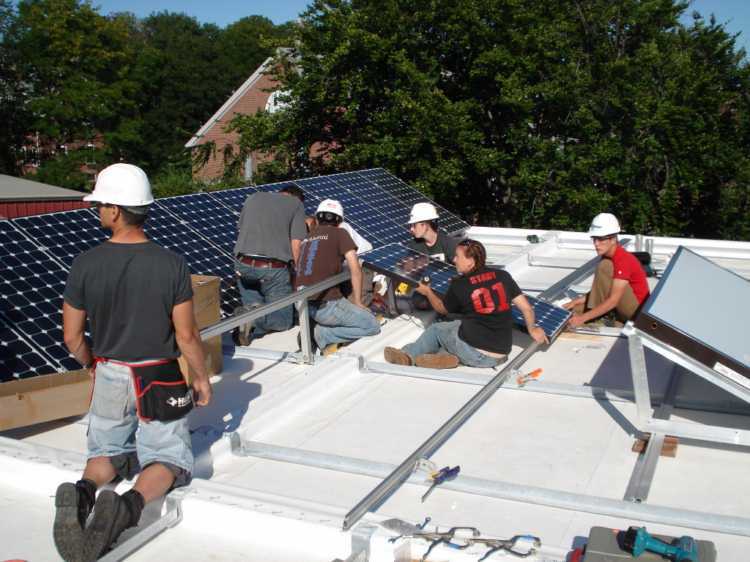 ASES.org - American Solar Energy Society promotes energy efficiency strategies and methods by hosting solar events, educating homeowners and organizations. Contains business directory of Solar Contractors. ConsumerEnergyCenter.org - California Energy Commission offers latest information on energy savings for homeowners, provides energy saving tips, information about alternative energy rebates and incentives, and general guide about benefits of renewable energy and why it is important. Features wide selection of educational videos on energy saving for consumers. GreenJobs.net - Green Jobs Network promotes jobs in green building industry, renewable energy, and environmental sectors. ToolBase.org - Provides detailed construction industry guides can be used by homeowners conducting a research on any particular construction topic. Home improvement contractors can look up remodeling design information. AllConstructionDirectory.com - Directory of residential and commercial construction companies, suppliers, and manufacturers. Provides basic information about the cost of residential construction and remodeling upgrades in the US.